The elementary program consists of both lower elementary (ages 6-9) and upper elementary (9-12). Providing a supportive, engaging environment with excellent materials. Emphasis on developing the children’s sense of wonder and love of learning. Respect for diversity and encouragement of mutual respect and cooperation. Character development to instill excellent morals and strong sense of responsibility. Integration of Islamic beliefs and texts in learning and routines. Elementary students attend from 8:30 a.m. to 3:30 p.m. daily. In physical geography, students gain a broad picture of the earth’s place in relation to the universe and its history, as well as land and water forms. Furthermore, students get hands on experience with physical and chemical processes such as gravity, inertia and erosion. In political geography, people, language and culture from different nations are explored. Verses of the Qur’an and hadith relating to the development of the universe and meaning of various natural events, and the role of language and culture are incorporated. The Primary classroom is further detailed to discuss the history of the universe and the earth as well as story of the human being; including the development of civilizations and the evolution of language, mathematics, and economics as they pertain to communities. In addition, the story of the Prophet Muhammad’s (pbuh) life is taught in its chronological place as coordinated with the Islamic studies program. MSE is also planning to teach the timeline for the other prophets starting with Adam (as) all the way to Muhammad (pbuh). Within the Elementary years the journey moves on to studying external and internal parts of both vertebrates to invertebrates. Further attention is paid to classifying animals into kingdom, phylum, class, order, family, genus, and species. The classification for plants will be conducted in a similar way by teaching their life cycles and the vital functions of both plants and animals. Verses from Qur’an and hadith about the types of creatures, their blessings, and the signs of God in such life forms are incorporated in these lessons. Students develop strong skills in analyzing properties of shapes, lines and angles and grow to more abstract topics such as congruence and theorems. Mathematics is taught using materials that physically demonstrate relationships, thus developing students’ intuitive grasp of numbers and operations. Moving from concrete to abstract learning, students hone their skills in mathematical operations and algebra. Students will learn how math is infused in all other subjects and in our daily activities. 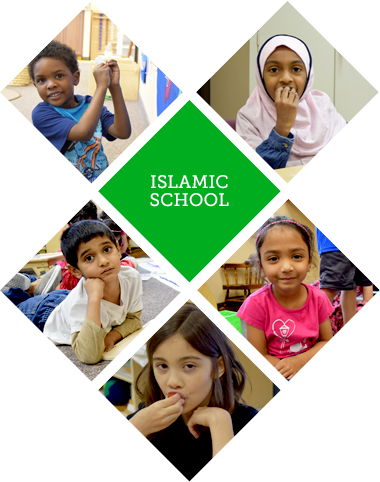 Students will be taught about Muslim contributions to this and other sciences. Students receive extensive training and practice in vocabulary, spelling, grammar, and punctuation. The children learn to use reading as a way to satisfy their natural thirst for knowledge as they are given a wide selection of research materials. Students are asked to write about their own settings and experiences so that continual practice does not become a repetitive chore, but rather an avenue of expression. MSE believes that every child needs both physical and mental development and aims in the near future to provide programs that encourage students to take part in various sporting or aerobics related activities. Now with our new school building and playground, physical education will include both indoor and outdoor activities on a regular basis.